Officer Lori Marks demonstrates video visitation at the York County Jail in Alfred. 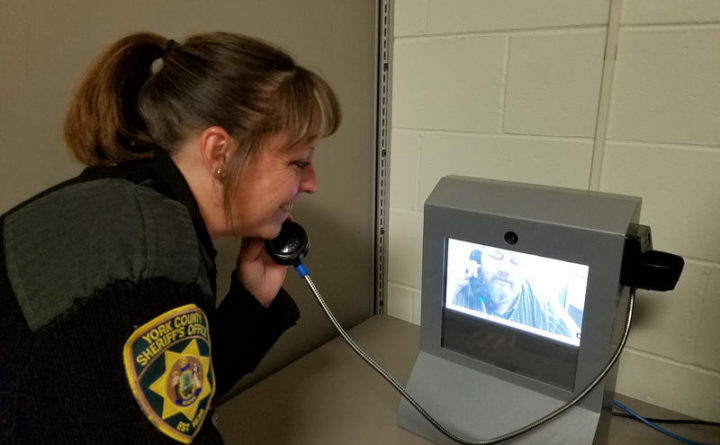 It is understandable that Maine’s cash-strapped county jails are turning to video visits for their inmates. Such visits require less staff oversight and, sheriffs argue, cut down on contraband being smuggled into jails. There are downsides, however, such as more discipline problems within jails, and researchers have found that switching from in-person to video visitation does not reduce contraband smuggling. Against this backdrop, Maine lawmakers passed a bill in March to preserve in-person visits for most county jail inmates. LD 1414 allowed for restrictions on such visits for safety and security reasons. Gov. Paul LePage vetoed the bill. Although his concerns about “micromanagement” of county jails are well placed, they are trumped by the value of in-person visits for inmates and their families. But lawmakers failed to override the veto. Although this means in-person visits won’t be required by law, Maine’s jails should not abandon them. Freed from the “micromanagement” LePage disdained, county jails will continue to set their own policies regarding visits, both video and in-person. These policies should be guided by research into what works best for inmates and their families, as well as jail staff and the communities to which inmates will return. Lehman, who spent five years in prison, spoke of how in-person visits allowed him to maintain a relationship with his daughter, a bond that remains strong today. Like Lehman, almost every inmate in the state’s jails will one day be released and go back to living in their communities. Whether they have support from family and friends is a major predictor of whether they will improve their lives or return to jail. Research shows that one of the best ways to maintain needed support and connections, and to reduce recidivism, is to allow inmates to remain in close contact with their families, including through in-person visits. “Family contact is one of the surest ways to reduce the likelihood that an individual will reoffend after release,” a report from the Prison Policy Initiative concluded. “When [prisoners] have that contact with the outside family, they actually behave better here at the facility,” the report quoted an Indiana prison official as saying. More contact is clearly better, and video visitation is better than no contact at all, the report notes. Maine jails have successfully used video visits to allow prisoners to remain in contact with family members who live far from the facility. But video visits have their drawbacks, the report noted, including the reality that a video visit just isn’t the same as personal contact, that it can be expensive for families (jails charge visitors for the video visits, sometimes as much as $1 a minute) and that the use of video visitation often means the end of traditional visits at a correctional facility. A review in Texas found that after video visitation replaced in-person visits, the amount of contraband in the Travis County Jail increased, as did disciplinary problems and inmate violence. In 2015, Texas lawmakers passed legislation similar to LD 1414, requiring county jails to offer inmates two 20-minute in-person visits per month. This all points to the fact that video visitation should be an enhancement to, not a replacement for, in-person visits. This should guide Maine jails if and when they adjust their visitation policies and procedures.